Info "It’s the bottom of the ninth. The bases are loaded, and we’ve got two outs. If you can throw a strike, this game is ours!" The Closer is one of Dribble and Spitz's Microgames in WarioWare: Smooth Moves. 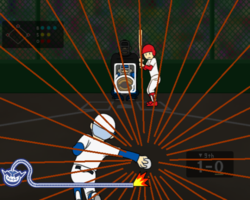 The player has to strike out by throwing the ball into the mitt by flicking the Wii Remote towards the screen. 1st level difficulty: The mitt is stationary. 2nd level difficulty: The mitt is moving side to side. 3rd level difficulty: The mitt moves around in a circle. This page was last edited on February 20, 2018, at 15:19.